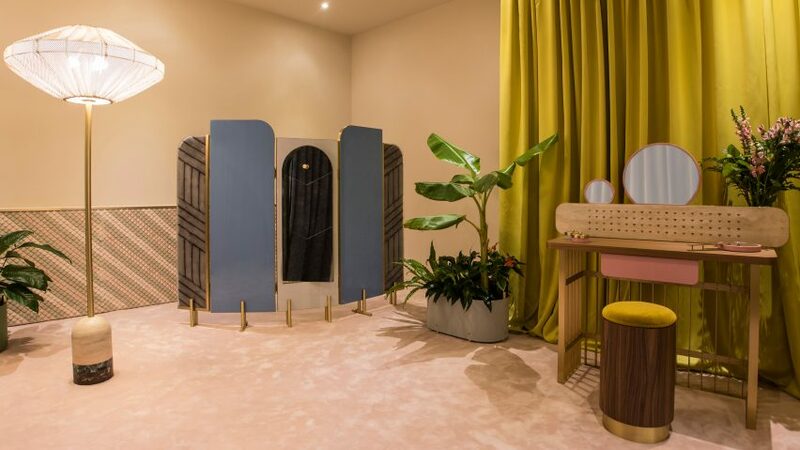 Italian designer Cristina Celestino referenced 50s furniture for The Happy Room, a travelling installation for fashion house Fendi shown at Design Miami last month. 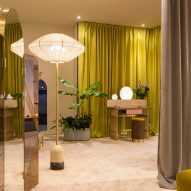 The room contains marble-topped tables, velvet seating and vanity tables made of polished wood and brass by Celestino. 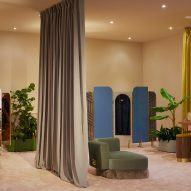 Fendi now plans to tour the room around the world, using it as a place to host personal appointments and show new materials. 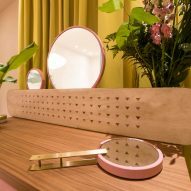 Low tables feature brass supports shaped to resemble an oversized butterfly earring back, and have inlaid tops made from contrasting colours and shapes of marble. 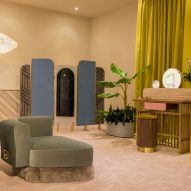 The butterfly motif is repeated as an ornamental addition to armchairs and sofas – which also have bases made of fur. 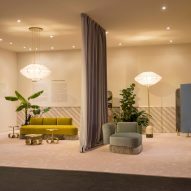 Floor lamps, wrapped in shades made from perforated calf skin, rest on striped domed bases also made from slabs of different marbles. 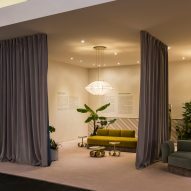 The space is divided by long velvet curtains in block colours of grey and yellow. 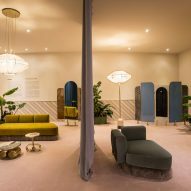 Celestino has also designed a screen for the space, which features an arch-shaped central mirror and surrounding panels made from Etere – a new material developed by Fendi that combines resin and fur. 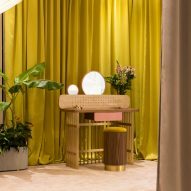 The designer, who founded lighting and furniture brand Attico in 2010, has previously created pieces for Italian furniture brand Seletti. 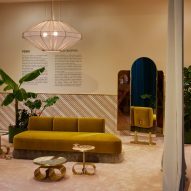 Collectors fair Design Miami was on from 30 November to 4 December 2016. 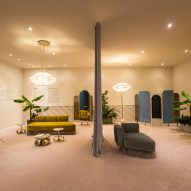 Also shown at the event was new work from Philippe Malouin, who created a "rollercoaster of light", and Misha Kahn, whose Scrappy Cabinet made from grass and trash was one of the fair's most talked about pieces.